My command center went through a major overhaul this year a couple of weeks ahead of Christmas as I upgraded my 19" LCD monitor for 32" LCD TV. This was good because I now no longer need to juggle swap A/V cables when ever I want to switch between watching Dialog TV, Playing the wii and ps2. SL. But still those two don't support full HD. On the otherhand, once you plug in the Mac mini via VGA, things looked great. 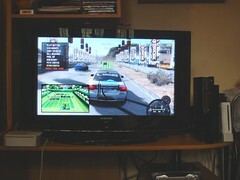 Playing DVDs also works well because a computer can upscale video. Unfortunately my Mac mini is an old G4 based one, and chokes under HD video. I'm also running out of desktop space to my full desktop PC. Size matters, and I miss my old barebone form factor. Anyway so I dropped a big one and bought a PS3! Yes it was heavy to carry out of the shop and heavier on the wallet but hey, now I've got HD through HDMI. Its all courtesy of "Buy now, suffer later" also known as Credit Cards :) Buy hey, atleast I'll have a ton of fun this Christmas while I keep the economy moving, right? Pretty cool :) What's your PSNetwork id ?